I have a soft spot for Chimichurri. It’s tangy, spicy, and perfectly cuts through buttery meat. I can’t say that I enjoy parsley on its own, so I always add just enough cilantro to downplay the parsley flavor (Cilantro is the star of every dish for me. See: Pho, tacos, e.t.c.). 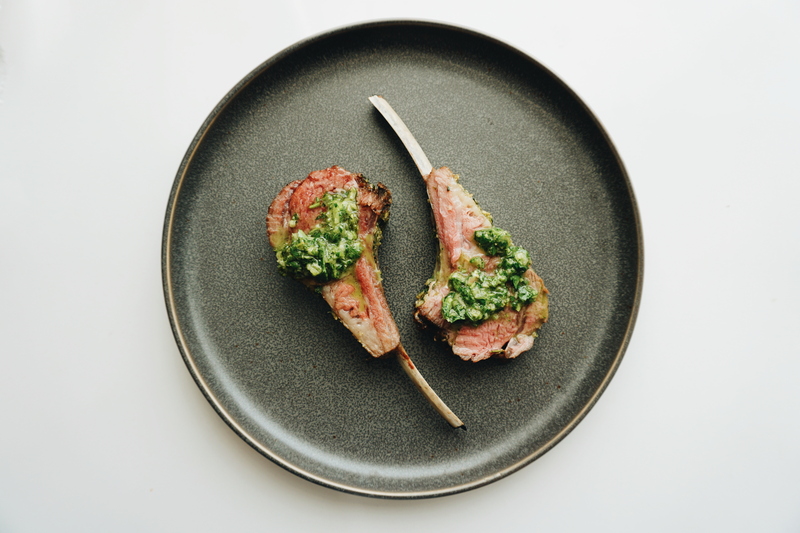 Most recipes for roasted rack of lamb don’t require searing the meat before going into the oven, but I think it’s the most important step to lock in color + flavor. No regrets. Disclaimer: I rarely measure ingredients when I cook. Most of the measurements on my blog are arbitrary and estimated, with the exception of baked goods. 2 racks of French trimmed lamb, around 1 1/4 pound each. Prepare the herb rub by pulsing the rosemary, parsley, garlic, olive oil, salt, and pepper in a food processor. Pat dry the lamb racks and liberally coat each side with salt and pepper. 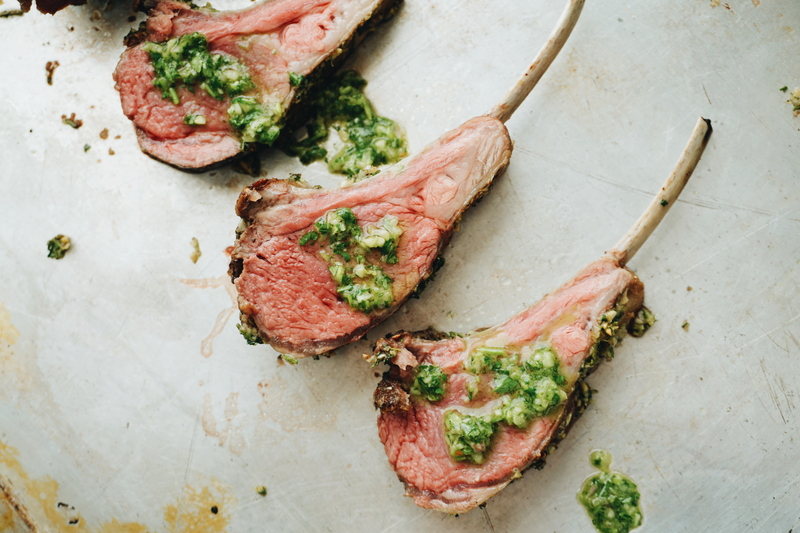 While the lamb comes to room temperature, make the Chimichurri. Pulse the parsley, cilantro, garlic, chili, shallot, vinegar, olive oil, salt, and pepper in a food processor. Preheat the oven to 350°F. On the stove, heat one large heavy-bottomed pan (or two small pans) on high heat. Thinly coat the pan with vegetable oil and sear the lamb, meat side down. After two minutes, flip the rack to be bone side down and sear for another two minutes. Set the racks on a rimmed baking sheet, bone-side down. Wrap the bones in foil to prevent charring. For medium-rare, roast for about 20-25 minutes, or until a meat thermometer registers 140°F-145°F at the thickest part of the meat. Keep in mind, the meat will continue to cook when it’s out of the oven. To seal in the juices, let the lamb rest for about 10 minutes before slicing. Serve with loads of Chimichurri. 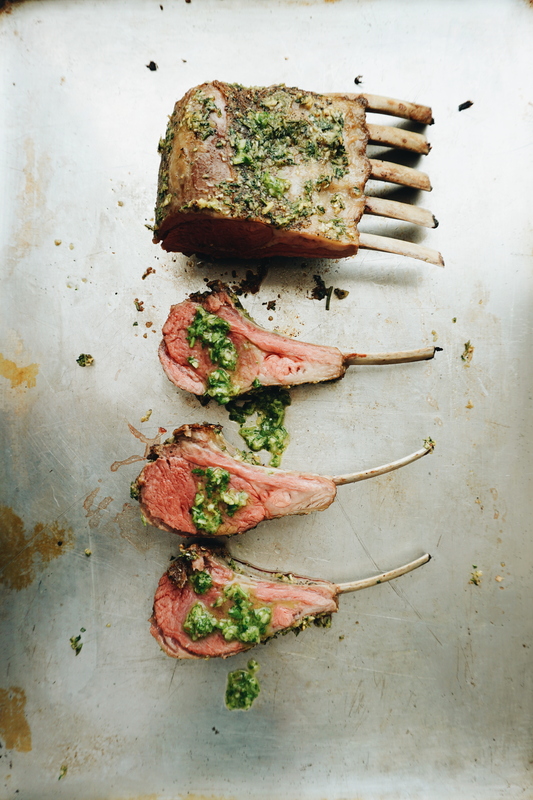 Rack of lamb and Chimichurri sounds fantastic!